Japan's third HTV cargo freighter is on track to plunge back into Earth's atmosphere as scheduled Friday after an unknown problem on Wednesday triggered an expedited departure from the International Space Station, according to a NASA spokesperson. The barrel-shaped resupply craft was released from the space station's robotic arm at 11:50 a.m. EDT (1550 GMT). A few minutes later, the H-2 Transfer Vehicle pulsed its thrusters and quickly flew away from the complex. According to Kelly Humphries, a spokesperson at NASA's Johnson Space Center in Houston, the HTV executed an abort maneuver. Like other spacecraft visiting the space station, the HTV is designed to autonomously command an abort in the event of a major problem to avoid colliding with the 450-ton orbiting outpost. "The abort system did what it was supposed to do and took the HTV safely away from the station, and it's on track to re-enter as scheduled," Humphries told Spaceflight Now. A daily space station status report posted on a NASA website said the abort was triggered by a drop-out of In/Out Computer 2. 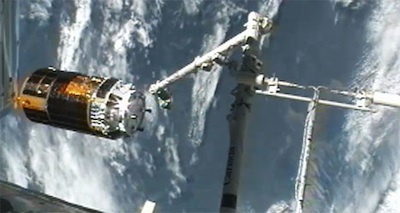 The maneuver placed the HTV well away from the space station, according to the status report. Japan Aerospace Exploration Agency flight controllers in Tsukuba, Japan, restored full telemetry from the HTV through another computer, and the root cause of the anomaly is under investigation, NASA officials wrote in the report. The Japanese cargo vehicle is scheduled to conduct a final de-orbit burn at 12:51 a.m. EDT (0451 GMT) Friday, and the spacecraft will drop back into the atmosphere at 1:24 a.m. EDT (0524 GMT). The HTV is designed to dispose of trash from the space station during re-entry, when the craft and its cargo will break up and fall into a remote part of the Pacific Ocean.